Boxing is one of those simple sports that teaches many profound lessons, like keep your hands up! Don’t hit your opponent below the belt! And all that grueling training will seem way more awesome if there’s an absolutely classic theme song playing in the background! 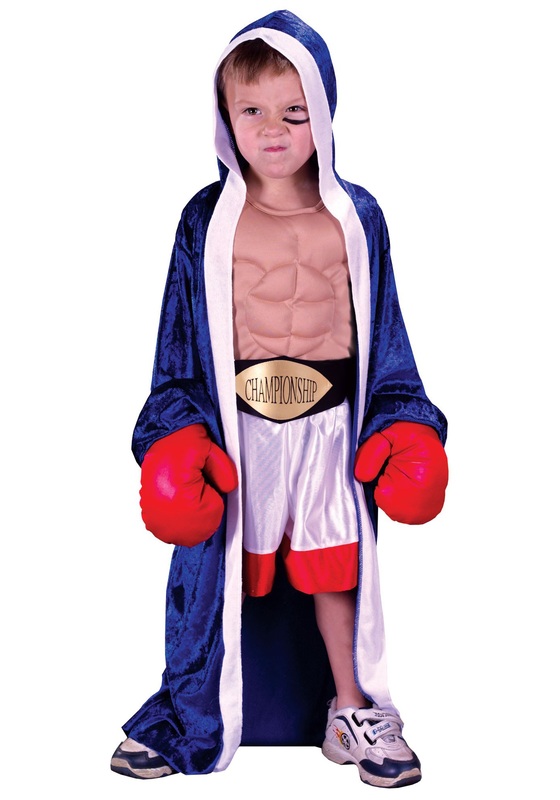 Even if you don’t like the idea of your pint-size pugilist getting beaten senseless, you have to admit that this Toddler Boxer Costume is pretty adorable. And whether you’re a fan of boxing or not, it’s fun just to imagine your kid working hard, getting tough, and becoming a world champ. Sure, most of us have no idea what our children will do when they grow up—but everybody knows that it takes the inner strength and discipline of a top-notch prizefighter to achieve greatness in any field. You never know: one day they may put his name in lights, or engrave it in the record books for some other sport, for some great discovery, or for his outstanding contributions to the arts! Then again, he might just push himself to excel at some weird talent, like training a flock of sheep to bleat The Star-Spangled Banner! Dressing him in a jumpsuit like this, with its chiseled-looking fake torso and its red-and-white trunks, isn’t quite like putting money on your little fighter to win a bout. It simply encourages him to hit life with his best shot again and again—to pick himself up as many times as it takes to finally reach the top! My toddler wears 24mth clothes and this costume fit him perfectly. I was able to put sweatpants and a sweatshirt underneath. I was mostly concerned about the length of the robe but it actually only came to right above his ankles. really nice product. loved it.